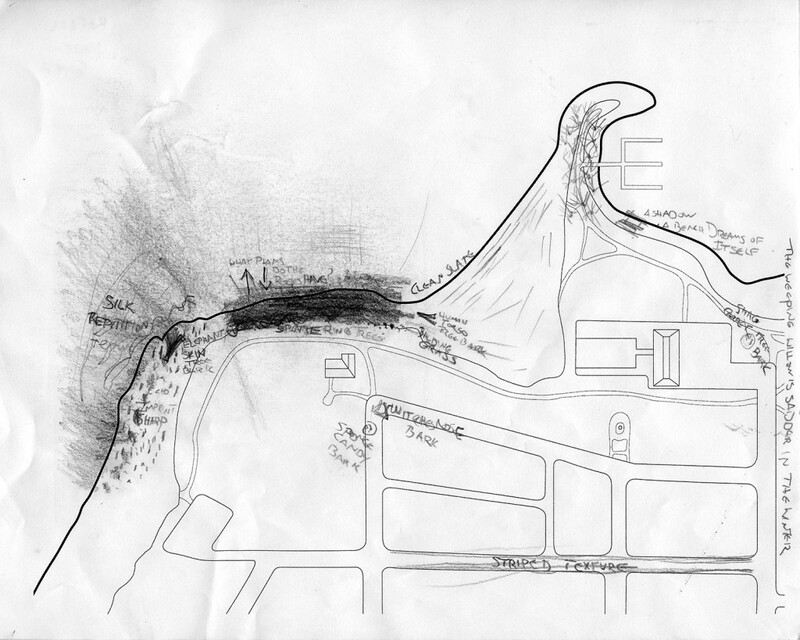 In collaboration with Rebecca Bayer, the Hadden Park Map Exchange was a series of mappings made in the vicinity of the Field House at the north end of Vancouver’s Kitsilano beach. The project brought together a diverse range of specialized practitioners and community members – scientists, historians, gardeners, performers, children and local residents – with a variety of artists and designers to produce a series of qualitative and unconventional maps of the site. The Map Exchange culminated with an exhibition at Access Artist Run Centre, Field Studies: Exercises in a Living Landscape, with Emiliano Sepulveda and Eden Veudry. Curated by Kimberly Phillips. Alexandru Balasescu, Marc Bricault, Javier Campos, Brian Chatterton, Bopha Chhay, Lisa Cinar, Paul Crowley, Charlotte Falk, Joel Good, David Gregory, Alex Grunenfelder, Andy Guiry, Sydney Hart, Jill Henderson, Genta Ishimura, Craig Johnson, Ross Kelly, Maria King, Rafaela Kirloss, Justin Langlois, Carla MacLean, Alex Muir, Raneen Nosh, Jhenifer Pabillano, Lisa Parker, Andrew Pask, Max Ritts, Kristen Roos, David Shewell, Travis Stasney, Fan-Ling Suen, Michael Tenzer, Erick Villagomez, Linna Zeibin. The intent of this project was to reveal the rich and complex layering of ecological systems, built infrastructures, social histories, and ephemeral exchanges present on a single site. Lead artists engaged a broad group of participants in a repetitive exchange process, drawing from the community’s diverse and nuanced knowledge of place. The site for this project is charged with a complex history and diverse set of current circumstances at a popular and ecologically varied waterfront setting. It is a compelling location to map from a wide range of perspectives. 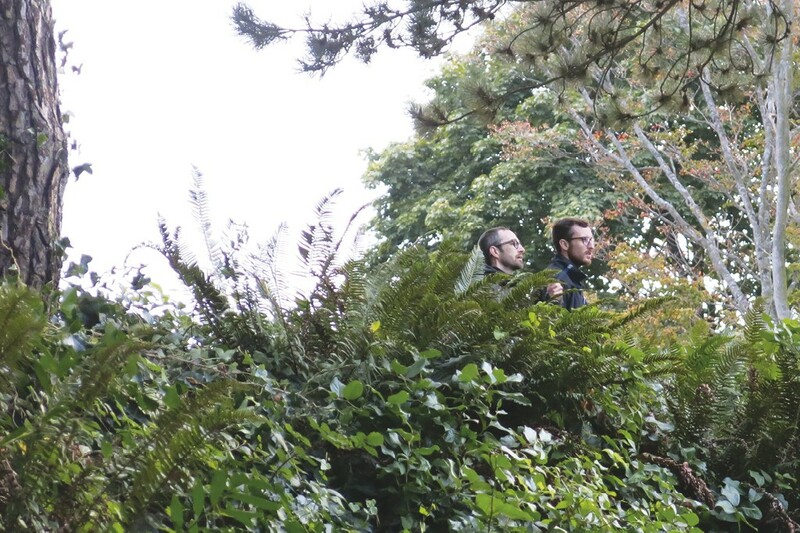 The process for exploring and recording site observations was intended to be generative, inclusive and open ended. Throughout 2014, curated pairings of participants were invited to meet at the Field House for two-hour sessions to explore the site and gather data. Participants were brought to the project in the role of either “Guide” or “Recorder,” and paired in such as way as to cultivate intergenerational and cross-disciplinary exchange. Each pair was provided with an identical base map showing the boundaries of the project’s site and sent out to navigate the site together. A set of clearly defined rules, including a geographical boundary and map to follow, gave consistency and clarity to each pair’s exploration. The Guides led the Recorders on the exploratory walk, observing and pointing out aspects of the site particular to their own expertise, background or interest. Guides were encouraged to view the site through their own particular lens or area of knowledge. Equipped with clip board, base map and pen, the Recorders collected field notes describing the site conditions or narratives described by the Guides. These field notes populated the blank base map, taking the form of mark-making, symbols, sketches or written words, which help indicate the route taken by the pair of contributors, densities of interest, and the data revealed by the Guides. The roughly recorded field mappings are shared here, and also provided raw data for the production of a larger, more refined maps. Both the field maps and the finished maps reveal the content of each exploration, as well as the Recorders’ visual styles, techniques, and approaches to mapping. 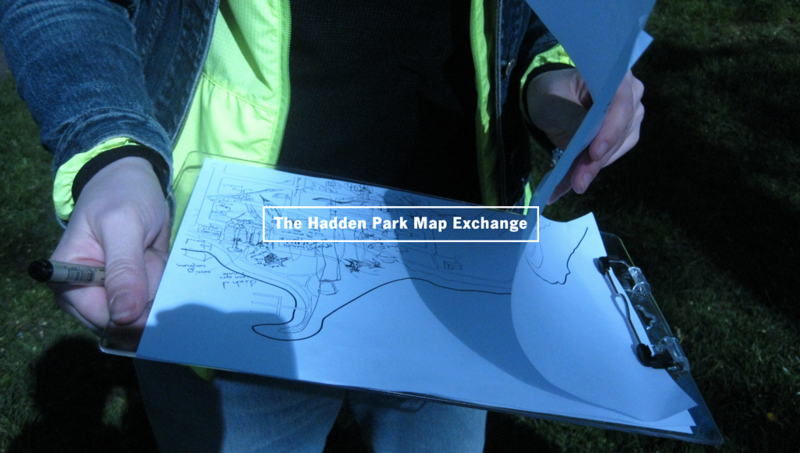 Through a repetition of this process, the Hadden Park Map Exchange produced a series of finished maps. When viewed as a set, the maps may begin to reveal patterns or loci about the site, as well as display the diversity of site observations and cartographic approach amongst the participants. 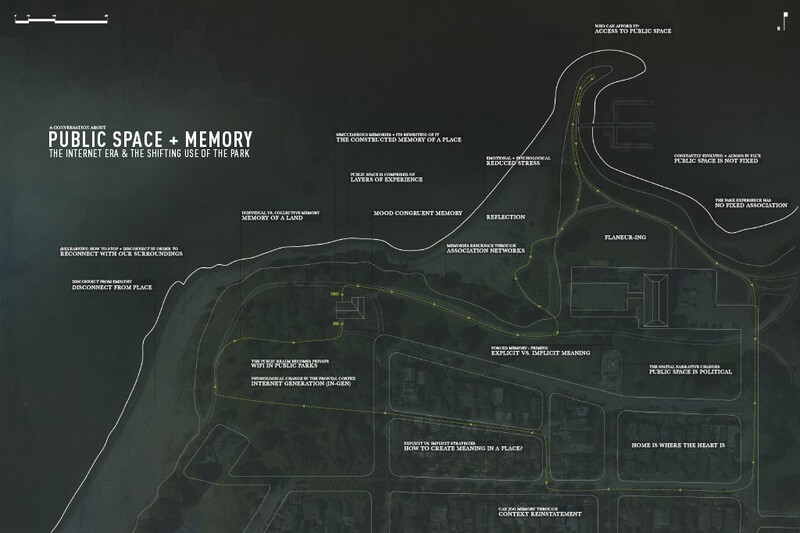 The site for this project is defined by the shoreline to the north and west of Kitsilano Point. It extends east to Chestnut Street and south to McNicoll Avenue. The vicinity includes public park land and beach, city streets and alleys, privately owned homes, marinas, museums, and liminal spaces in between. It is approximately the size of four city blocks. The site was chosen as a place rich with social and ecological history, many factors of which are still at play. Traditionally, this land was used by both Musqueam and Squamish First Nations for seasonal hunting and fishing. In 1877 the Squamish First Nation was allotted 86 acres of land directly neighbouring what is now Hadden Park. Parcels of this land were subsequently taken one by one by the Province and Federal government for the building railways and other uses, including defence during WWII. In 1928, Harvey Hadden purchased a block of land from the Canadian Pacific Railway, including the point at the north end of Kitsilano beach, which he then donated to the Vancouver Parks Board with the intention to develop the beach area for public bathing. The park became known as Hadden Park. Streetcars brought day-trippers to the area and a popular destination for colonial immigrants was born. Hadden Park changed in shape as the coastline was adjusted for building a small marina and adding extra land during WWII. The Hadden Park caretaker Field House (with public washroom and concession stand attached) was also added during WWII. In 1958, a totem pole carved by the Kwakiutl First Nation was erected in Hadden Park, and shortly thereafter, the Vancouver Maritime Museum was added to the site. Development of single family homes on nearby streets brought a predominantly white population to the area which succeeded in protesting the development of seaside industry in the 1950s. Around this same time, local residents were granted a request to build a walking path along the Hadden Park ridge. In the 1980s, this path was renovated to connect with the Vancouver Seawall around False Creek. A newly released plan (October 2013) to add a 12’ wide bike lane beside the existing foot path at Hadden Park which would connect the Seawall further to Jericho Beach has been met with fierce resistance from many local residents. The beach that Harvey Hadden intended for public bathing became a designated dog off-leash zone in the 1990s. This decision, while welcome by many, has continued to cause uproar in the area. Public swimming, along with beach volleyball, basketball, sunbathing, and other fashionable leisure activities are the main attraction at Hadden Park’s neighbouring Kitsilano Beach. Socially, Hadden Park has become Kitsilano Beach’s quiet yet devout alter-ego. 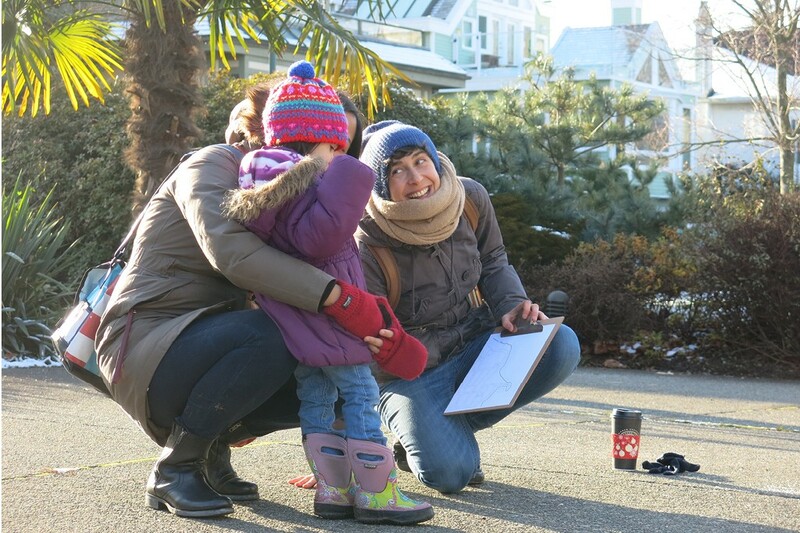 The site of this mapping project encompasses a rich mix of Vancouver’s past and present, and it is also ecologically complex. Tides change the appearance of the shore throughout each day, revealing large granite rocks grown over with barnacles, mussels, and sea kelp. Sand and pebbles come and go. A steep cliff is covered with thick thorny blackberry bushes that feed the local birds and wildlife. There is a maple grove lined with soft grasses, planted at the time of Harvey Hadden. It is not uncommon to hear numerous types of birds at one time while sitting in the park, or to see seals swimming nearby. Copyright © Access Gallery and the contributing authors and artists, 2015. Content from this book cannot be reproduced without express written permission from the publisher.